It is a report of autumn project activity in Azumino park (Omachi • Matsukawa area). This time is set in the old private house peculiar to the mountain which was transferred in the park called "House of the Somabito", art reproduction= Try re-creation, it is showing as a "house of kiryu-bu" quietly standing in the park. Also, a workshop will be held to decorate the forest around the house, with visitors. This exhibition is a pre-event for 2020 of the Northern Alps International Art Festival. Please join us and have a look! The Northern Alps International Art Festival was decided to hold the second round in 2020. 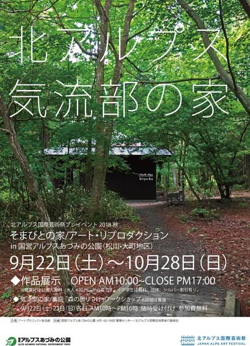 We will hold a special exhibition of the middle art year of the art festival jointly with the Northern Alps International Art Festival Executive Committee and the State Opinion Alpine Azumino Park (Omachi • Matsukawa area) District Management Center two years from now. "Art project kiryu-bu" which established the base of activities at the state-run Alpine Azumino park on the occasion of the exhibition of the Art Festival in 2017. In collaboration with the management center, the 2018 fall version of the attempt to practice the new activities of the park utilizing art throughout the year and the possibility of region × art. Also, we will establish the base of this autumn activity for "House of the Somabito" (transplant construction in the park) for a limited time. The atmosphere of the alluvial fan of the Northern Alps remains, with the conifer forest belt with large rocks scattered, we will create a landscape peculiar to the North Alps as a new space work with the guests. The visitor will experience the air at the foot of the mountain more.